In 1983, two weeks into my first pregnancy I started to experience regular debilitating migraines that lasted well beyond the birth of my second child two years later. After 8 years, I found a local GP who was versed in Hypoglycemia, or Low Blood Sugar. After a test, he decided that this was what I had. By not eating sugar, I was able to keep the migraines at bay. In 2006, I went to a naturopath who claimed she could release food allergies & sensitivities. After several treatments I found I could eat sugar and drink coffee and not get a migraine, but after 5 months I started to experience a strange depression that came out of nowhere. On the day that Kveta Jasek met in May 2011 and asked how I was I wasn’t even able to chew a piece of sugarless gum without getting depressed! 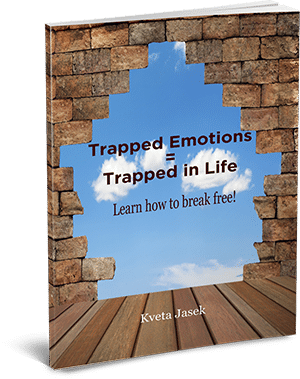 I saw Kveta the following day for my first treatment with the Emotion Code. The treatment lasted an hour and she released 8 trapped emotions. A week later I was eating all the foods I had eaten before my first pregnancy.